Give your robe and other bathroom garments a contemporary boost with the classy and elegant Square Robe Hook. This practical bathroom accessory is designed to be installed on a wall or a door and is perfect for hanging your bathroom garments. The Square Robe Hook features a sleek geometric design and sports an elegant chrome finish. 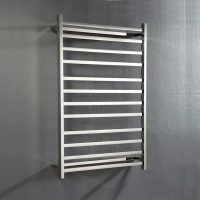 It will fit very well to complement existing bathroom décor, contemporary tapware and other bathroom accessories. It also features concealed fastening, which makes for a seamless and neat appearance. This robe hook weighs 0.1kg and features premium brass construction. It is sturdy, durable and reliable and is built to last. It also features a smooth body, which protects garments from tearing and pulling. 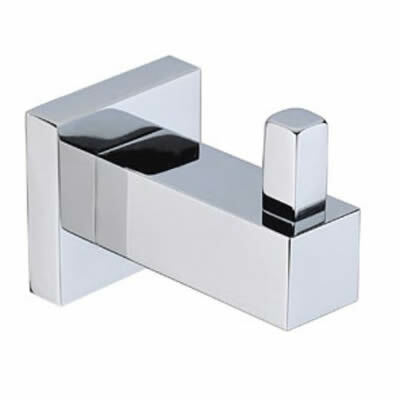 Moreover, the high-quality chrome finish will not lose its lustre or charm even after years of usage. The Square Robe Hook is crafted to perfection and exhibits superior workmanship. It is a fine product that is manufactured using top grade materials and is built to meet Australian standards of quality. So, get yourself this wonderful robe hook and bring an appealing edge to your bathroom. Buy this practical bathroom accessory at an incredibly affordable price from our online store today!